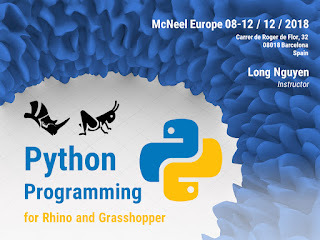 McNeel Europe and Long Nguyen, research associate at ICD Stuttgart, are presenting two Python workshops this April 8-9/10-12. Python is an increasingly popular programming language widely used in many fields, from 3D modeling, web programming, to scientific computing, artificial intelligence, etc. Creating simple Rhino commands Using Python, etc. Python level 1: EUR 495,- (+VAT); full-time students and university teachers get a 50% discount (proof of status required). Python level 2: EUR 795,- (+VAT); full-time students and university teachers get a 50% discount (proof of status required). Please note your seat is only confirmed after payment has cleared. Max. number of participants for each course: 10. If there is no quorum, the course will be canceled 15 days before. Posted Mar 06, 2019 by Verena Vogler on Rhino News, etc. So… what’s in the level 2 course? Edit: Oh wait, I see on the Rhino news page. It got mixed up in one of the bullet points here. Thanks for pointing that formatting problem out. I’ve fixed it now.